Learn more about events hosted by EHI, helpful resources, and featured articles. Unraveling one of the biggest environmental scandals of our time, a group of citizens in West Virginia take on a powerful corporation after they discover it has knowingly been dumping a toxic chemical - now found in the blood of 99.7% of Americans - into the drinking water supply. The EHI gathered for this free screening of The Devil We Know: The Chemistry of a Cover-Up which was followed by a panel discussion with PFOS science, policy and advocacy experts Anna Reade, PhD, Natural Resources Defense Council, Tom Bruton, PhD, Green Science Policy Institute, and Elizabeth Hom, PhD, from UCSF's Program on Reproductive Health and the Environment. The Exposome & Metabolic Health: What's Getting Under Your Skin? Leading University of California researchers discussed how our social, psychological and physical environments impact our metabolic health and shape our future. 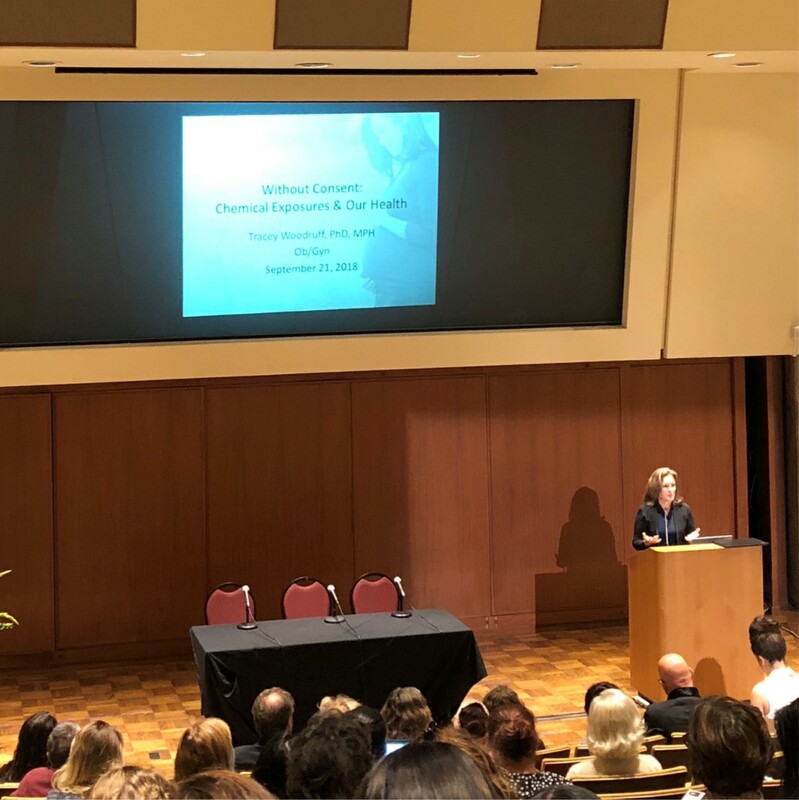 In this symposium, which was co-sponsored by PRHE's Environmental Health Initiative, attendees learned about how toxics from our food, air, and social environments are having unseen effects and how we can respond. Click here for more information. 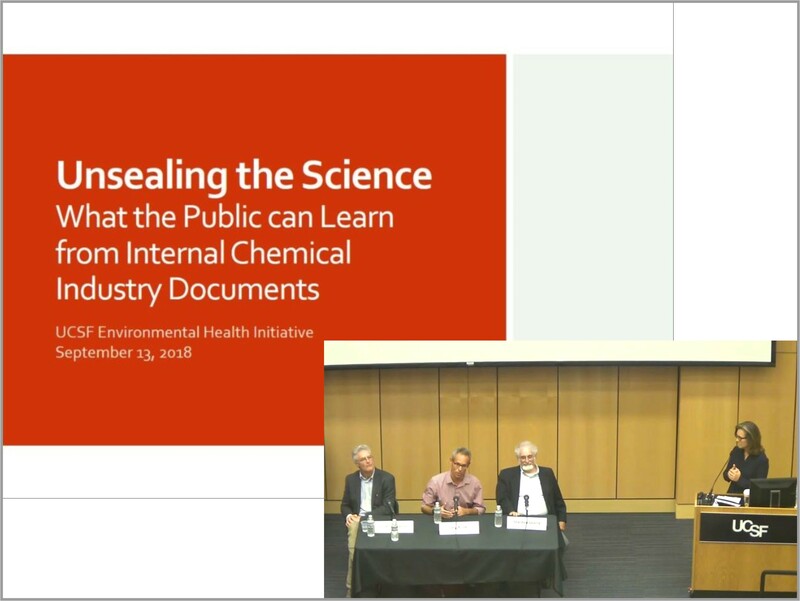 The Environmental Health Initiative, in collaboration with the Program on Reproductive Health and the Environment and the UCSF Industry Documents Library, hosted a day-long series on the science and stories contained within three new collections of chemical industry documents being added to the library. Events were open to the public and located on the UCSF Mission Bay and Parnassus campuses in San Francisco. 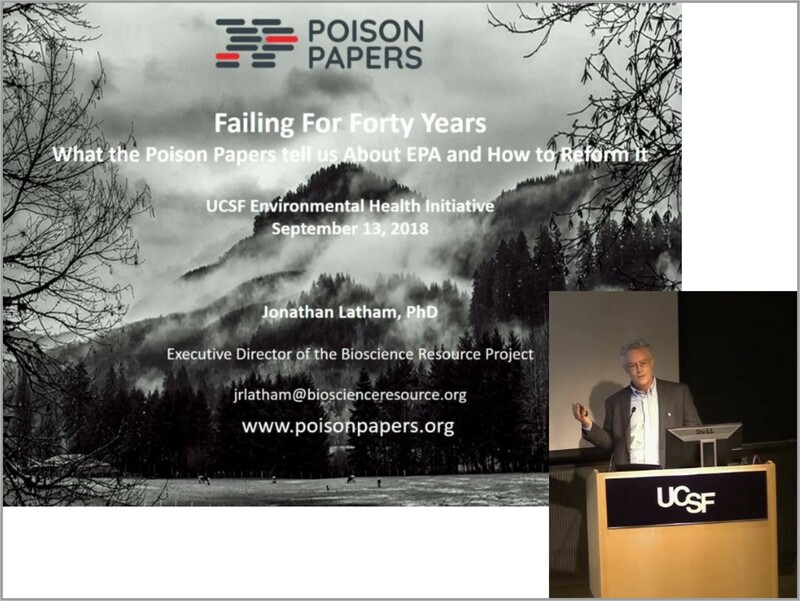 Dr. Jonathan Latham, Director of the Bioscience Resource Project talked about the importance of the 20,000-document collection and how it exposes problems with both the internal culture of the EPA and its legal framework that are often fraught with industry influences that prevent precautionary decision-making, even when the science clearly points to danger. The documents that have come to be known as the Poison Papers were collected over a period of 40 years by Carol Van Strum, Diane Hebert, Eric Coppolino, and Peter von Stackelberg, who served as custodians of the documents, gathering, storing, scanning, and distributing them. Their ultimate goal was to make the documents accessible to anybody and everybody who might need them. The Park Foundation, The Bioscience Resource Project, Center for Media and Democracy, and the late Rosalind Peterson helped fund this endeavor. Watch the talk here or click the image above. Watch the panel here or click the image above. What does it mean to share our science outside of the lab and professional journals in public settings? What happens when our conclusions based on the scientific method enter political discourse? Watch the symposium below to hear from faculty on how they have overcome these challenges and unabashedly taken on the responsibility and commitment to share what they know. The symposium included opening remarks by Congresswoman Jackie Speier, 14th Congressional District; moderation by Tracey Woodruff, PhD, Program on Reproductive Health and the Environment, and Diana Laird, PhD, Department of Obestetrics, Gynecology & Reproductive Sciences; panel presentations by Stanton Glantz, PhD, UCSF Center for Tobacco Control Research and Education, Cristin Kearns, DDS, MBA, UCSF Post-doctoral fellow studying the sugar industry, Mike McCune, MD, PhD, UCSF Division of Experimental Medicine, Linda Rudolph, MD, MPH, Center for Climate Change and Health, Public Health Institute, Barbara French, UCSF Vice Chancellor for Strategic Communications & University Relations, and Greta Schnetzler, JD, UCSF Chief Campus Counsel. Watch the symposium here or click the image above. David Gee, PhD, Past Senior Advisor on Science, Policy, and Emerging Issues for the European Environment Agency, presented “Late Lessons from Early Warnings”, based on a series of publications addressing the health costs of action and inaction on threats to environmental health. “Late Lessons from Early Warnings”, published by the European Environment Agency, grapples with the health costs of such decision-making head on using historical hazards, such as the Minamata mercury poisoning and leaded gas, as well as emerging issues, such as radiation from mobile phones and neonicotinoid pesticides. The lecture resonates with contemporary decision-making, i.e., lead poisoning in Flint, Michigan, and toxic chemicals in consumer products and our food supply, and offers a pathway forward for taking action on what we know now to prevent harm to human health now and for future generations. Watch the seminar here or click the image above. 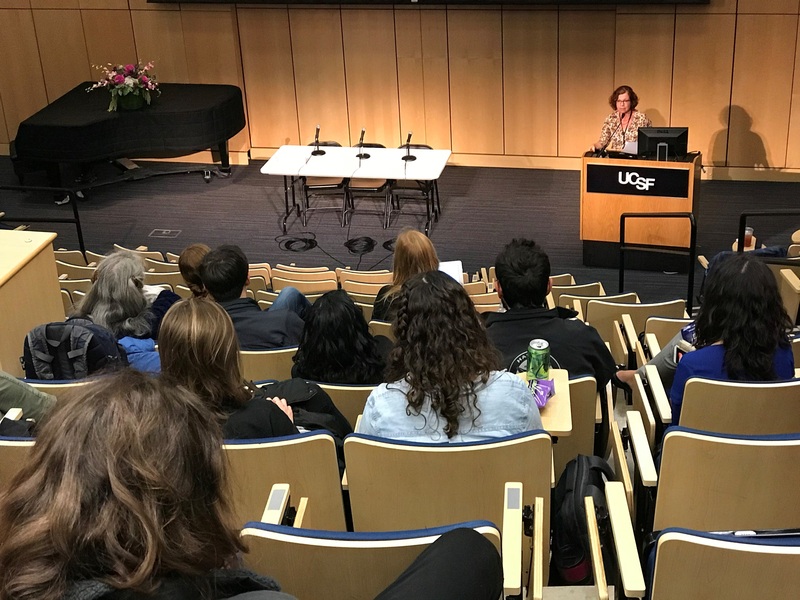 "In Trump's America, UC researchers learning to advocate for science"
"Science in an Age of Scrutiny: How Scientists Can Respond to Criticism and Personal Attacks"
"Tobacco Industry Efforts to Undermine Policy-Relevant Research"
"Guidelines for Working with News Media"